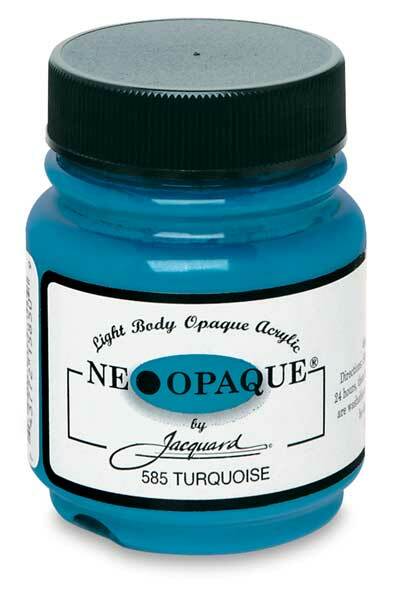 Neopaque Colors are light body opaque acrylics that can be painted, screened, stenciled, marbled, and stamped. Use them on all surfaces, including wood, leather, canvas, paper, and natural and synthetic fabrics. (They are similar in consistency to Jacquard Lumiere colors, but are non-metallic. A light application covers well on black or dark backgrounds). Neopaque colors mix into and "antique" Lumiere. When used on light or white fabrics, the colors produce an intense color scheme. 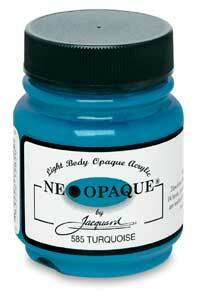 The Neopaque Flowable Extender is also a suitable medium for Pearl-Ex pigments. Lumiere and Neopaque Exciter Pack — Lumiere and Neopaque are light-bodied paints that produce a super-soft feel on untreated fabric, leather, silk, paper, wood, and more. The pack contains 0.5 oz (15 ml) bottles in 9 colors, including Metallic Gold, Metallic Olive Green, Metallic Copper, Metallic Bronze, Pearlescent White, Pearlescent Violet, Pearlescent Blue, Black Neopaque, and White Neopaque. To view a PDF of instructions for Jacquard Neopaque, please click here.